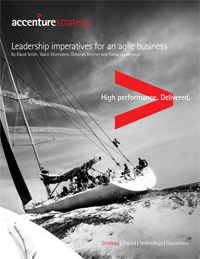 As detailed in the Accenture report, Leadership Imperatives for an Agile Workforce, top-performing companies have leaders who establish a culture of making big decisions quickly and then implementing them with the needed scale, buy-in and accountability. I was surfing on a different Insurance activity(which I am proposing with my Investors) and then I chanced upon your articles. I found that your articles are stimulating and come with breath taking analysis as to how Insurance business is going to evolve in the future. The role of Brokers in the near future was an eye-opener and very informative. I believe that all Strategists who are working in the Insurance Sector in India must make it a point to read your articles to understand where they stand. I am going to recommend your articles for their study. Thanks a lot. Next Post - A Changing Marketplace, Part 2: How is life insurance keeping up with US population shifts? Suggested Post - A Changing Marketplace, Part 2: How is life insurance keeping up with US population shifts?